After a short recap of your theoretical knowledge about fluids and electrolytes in the human body, you will learn more about IV fluids and isotonic, hypotonic, and hypertonic solutions as well as tonicity. 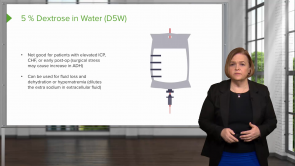 Armed with this knowledge, you can safely evaluate your patients fluid status and determine the impact of fluid volume movement based on the IV you are infusing. A walkthrough of an NCLEX exam level question will strengthen your knowledge. Besides high-quality video lectures, you will get access to quiz questions and download material. If anything remains unclear, you are able to post your questions to our forum. They will be answered by our experts. Start learning today! *This course will be completed shortly. Rhonda Lawes is a Certified Nurse Educator (CNE) and Assistant Professor at the University of Oklahoma. She worked as a nurse manager at the Saint Francis Hospital and the Broken Arrow Medical Center. She has completed her Ph.D. in Educational Psychology at Oklahoma State University.